Pattern mixing is a great way to maximize what you already have in your closet by putting things together you haven’t combined before. You’ll also look like a pro and that you know what you’re doing since pattern mixing is daunting for some! Now that we are mid-summer, I like to throw in some stripes with other patterns to mix things up and wear what I have in new ways. Below are my tips on how to do so seamlessly. Stripes are your friend. I think a easy way to start with pattern mixing is to use some striped pieces. 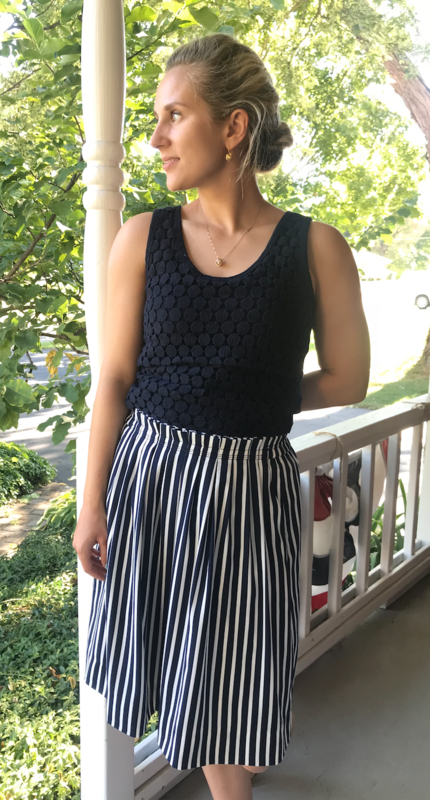 I am not bold enough to wear stripes with stripes since it can often be too busy, but pairing it with another item that has a larger or more spaced out pattern works great. For this outfit, I would avoid doing a smaller, tiny pattern since the stripes on this skirt are already close together. 2. Mix texture with pattern. I think an interesting way to switch up your wardrobe is taking a patterned item, like this skirt, and pairing it with a coordinating item that has the same color palette but a different texture. 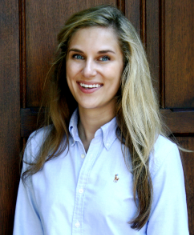 This tank has a very subtle eyelet pattern that looks great when worn with the striped skirt. Find some clothing in your closet that has a textured pattern to it and try it with a bolder pattern for a eye-catching look. 3. Have some fun. It’s easy to take a patterned piece, like these seersucker shorts, and go the easy route of wearing a solid color with it. 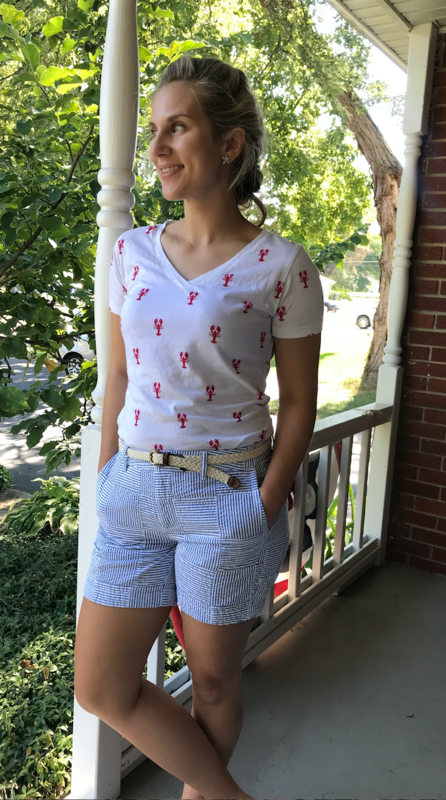 It’s not wrong to do so, and is a refreshing look, but pairing it with this lobster motif makes the outfit pop a little more. Sometimes items like these shorts keep me stuck in repeating the same pieces with it, but with pattern mixing I can open up to more outfit choices. Something busy like the shorts looks great with something a little less busy to balance it out. Keep in mind that style means something different to everyone and these are only my opinions. My main focus when creating an outfit is to look put-together, so I gravitate towards more conservative approach to pattern mixing that relies on subtlety rather than loud/bold. Want more pattern mixing inspiration? 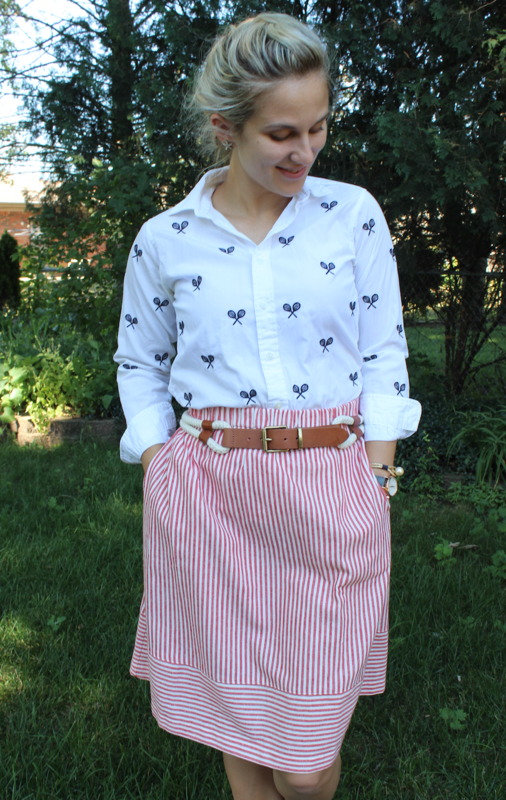 Check out @respecttheshoes on Instagram – she is my favorite girl for pattern mixing. She keeps it fun and everything always looks well thought out.